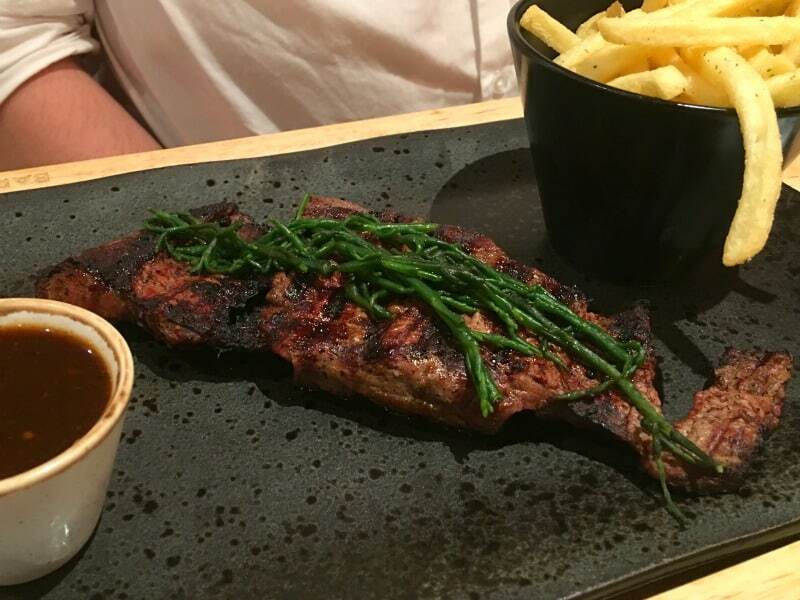 There are lots of places to eat in Nottingham but if you really like steak you might want to check out Bar + Block on Chapel Bar near Maid Marion Way. Seeing as it only opened a few months ago, it’s still considered to be one of the new restaurants in Nottingham so we were keen to go and take a look. The invitation also coincided perfectly with our wedding anniversary, so it came as a welcome treat for us too. We arrived at Bar + Block on one of those ridiculously hot summer evenings we’ve been having recently so it was lovely to walk into a beautifully air conditioned restaurant to be greeted by a full size butchers’ neon cow. 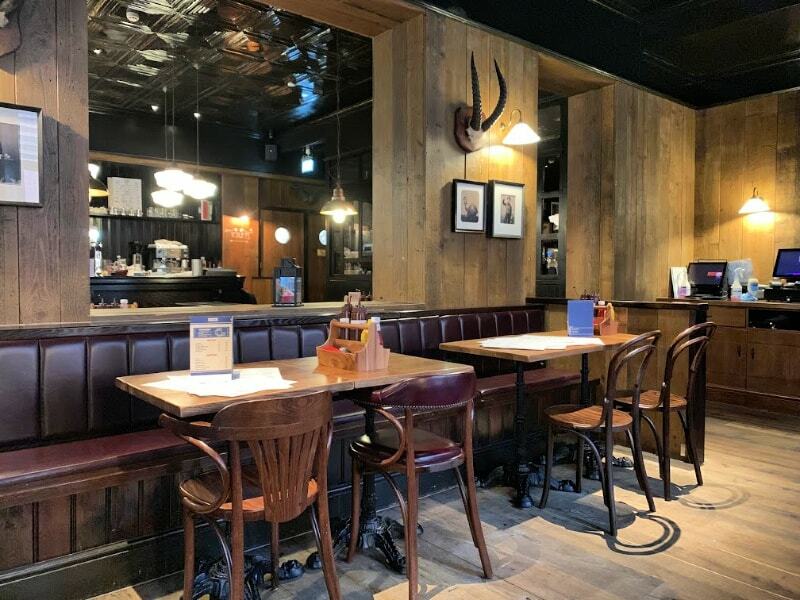 I was immediately impressed with the interior and would best describe it as a modern saloon with lots of wood and warm cooper tones throughout. We were shown to our table next to the open kitchen and our waitress, Amy bought us some table water and a tub of popcorn to munch on while we perused the menu. 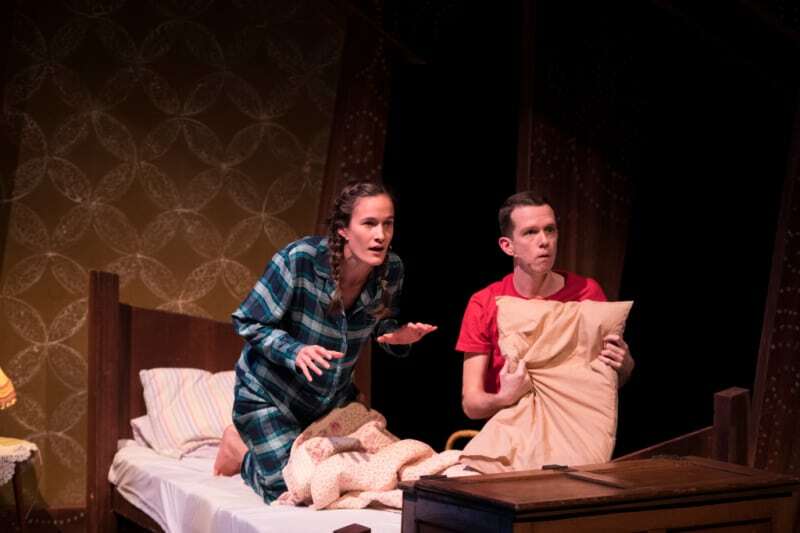 Now, popcorn is nice but you wouldn’t normally shout home about it would you. Well the popcorn at Bar + Block is a whole different kettle of fish. It’s been cooked in beef dripping and coated in beef flavouring. It sounds odd, but trust me when I tell you that it works. Bar + Block is definitely one of the best restaurants in Nottingham for popcorn (as well as steak) if that’s your thing. After much deliberation we decided to kick off our meal with the Atlantic Scallops and Salt and Pepper Squid. To wash it all down with we decided to sample the Havana Mojito. 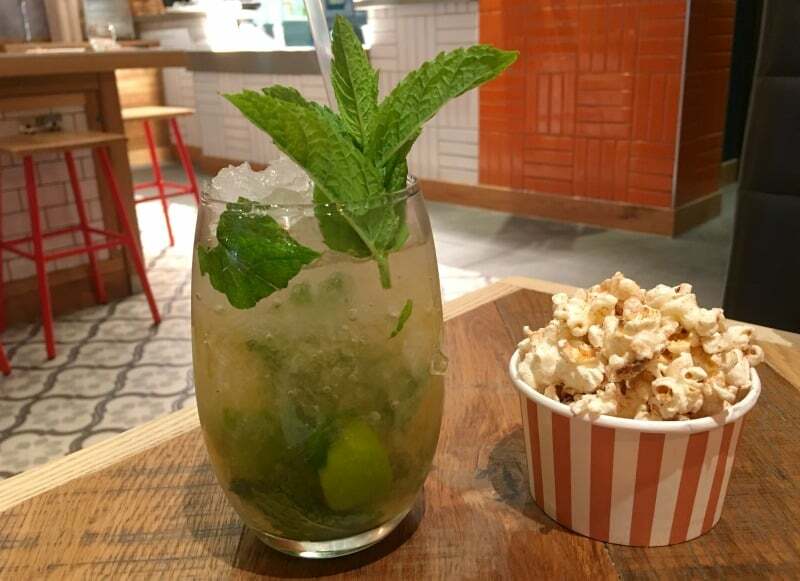 This particular cocktail with Havana rum, fresh mint and lime served over crushed ice is a must if you like your cocktail with a kick. 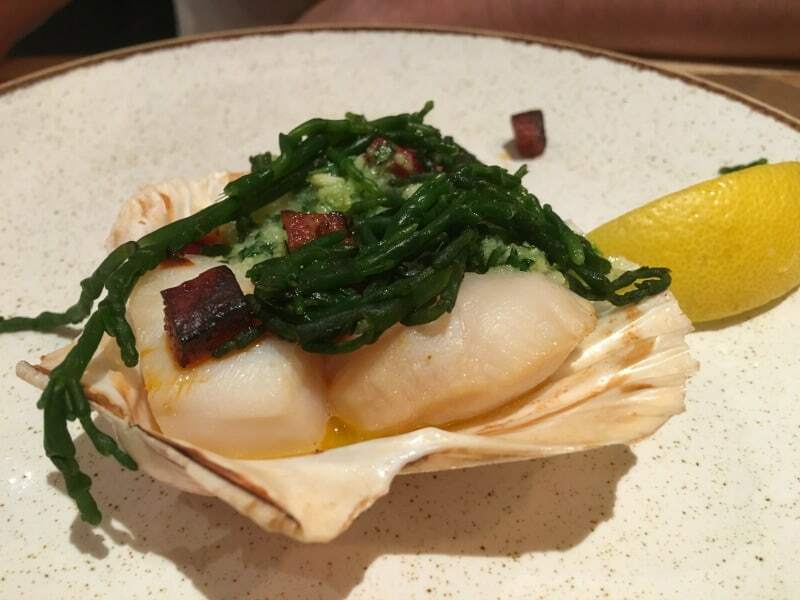 Our Atlantic Scallops were light and delicious and went perfectly with the chorizo and garlic butter. A drizzle of lemon cut through the flavours giving the dish a bit of an edge. I’m so glad my husband and I decided to share the starters, as I wouldn’t have wanted to miss out on this particular combination. 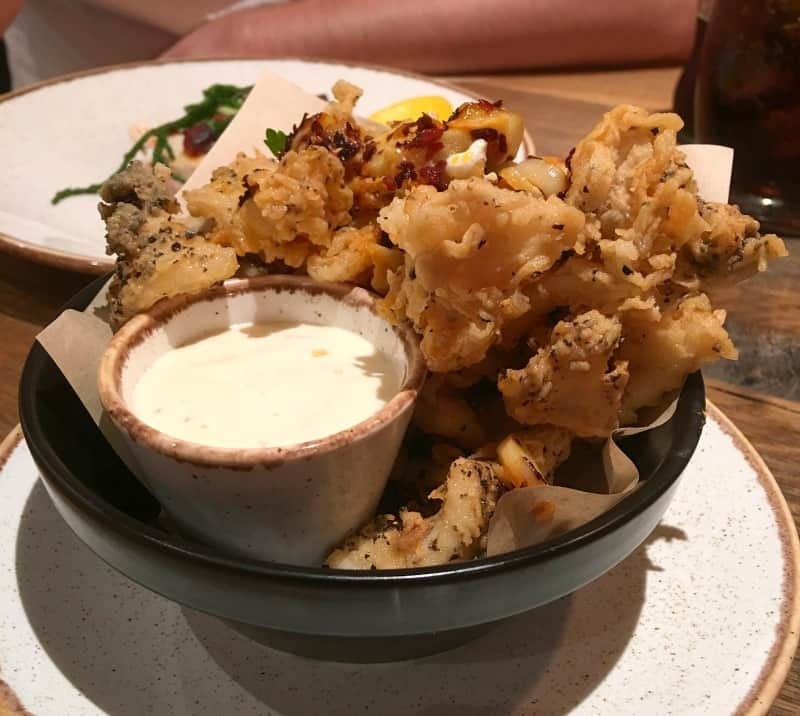 One of my favourite dishes is crispy squid, so my standards are pretty high when it reaches the table. This Salt and Pepper version from Bar + Block really hit the spot. The batter was crisp and light while the squid was cooked just perfectly inside. The dish was topped with fresh garlic and fried chillies which are literally two of my favourite things bringing plenty of flavour to the plate. The lemon and garlic mayo on the side was also perfect for bringing the flavours together and taking the edge of the heat when needed. The starters certainly got us excited for the main event which was surf and turf for me and the spiral cut fillet 10oz steak for my husband. Both steaks arrived at the table medium rare as requested. The steaks at Bar + Block are aged for a minimum of 28 days and this makes the really tasty. The spiral cut had been marinated in garlic and parsley for 24 hours for extra flavour and was also topped with well presented fresh herbs. The 8oz sirloin steak that was presented to me was topped with a generous king prawn cooked in garlic butter and samphire. Despite being a little messy to eat it was well worth the effort. Both steaks were served with a generous portion of fries that were crispy on the outside, seasoned to perfection and fluffy on the inside. What’s not to love, right! We couldn’t have a steak at Bar + Block without testing out the steak sauces. 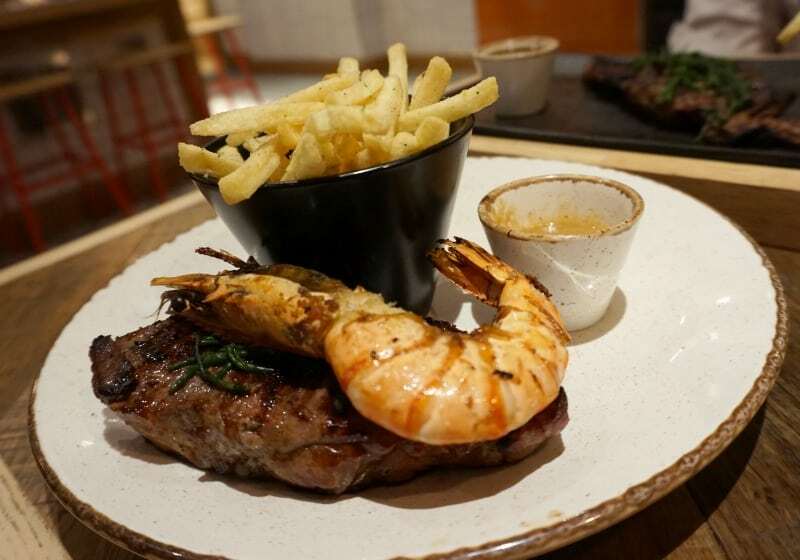 I loved the trio of peppercorn sauce served with the surf and turf, it was flavoursome yet delicate which is a tough combination to crack in my opinion. My husband tried the signature Fiery Black Sauce, which packs a mighty punch with it’s strong combination of secret flavours, definitely not for the feint hearted. As anniversary meals go, Bar + Block really came up trumps for delicious starters and quality steak, but how did we get on with dessert? 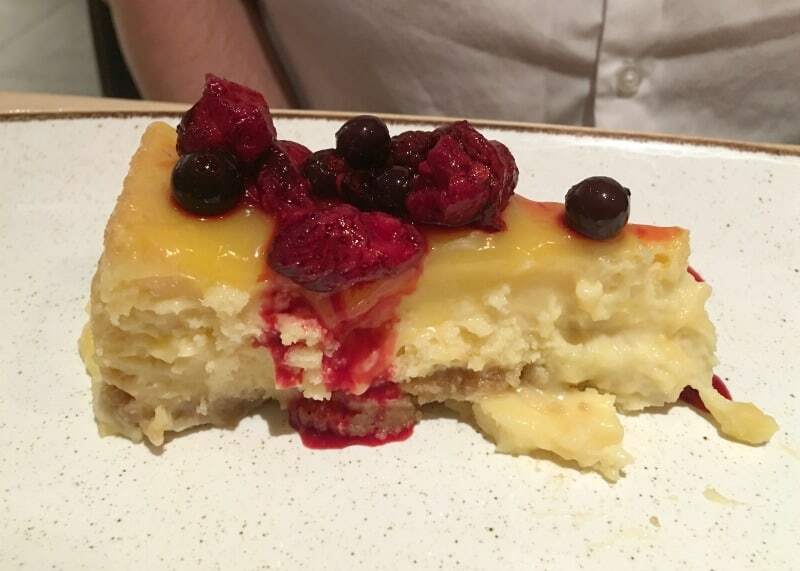 With a little room to spare we decided to try the Lemon & Clementine Cheesecake topped with summer berries and the Sticky Toffee Pudding with salted caramel ice cream. The cheesecake probably could have been presented a tint bit better, but it didn’t disappoint on flavour in the slightest. 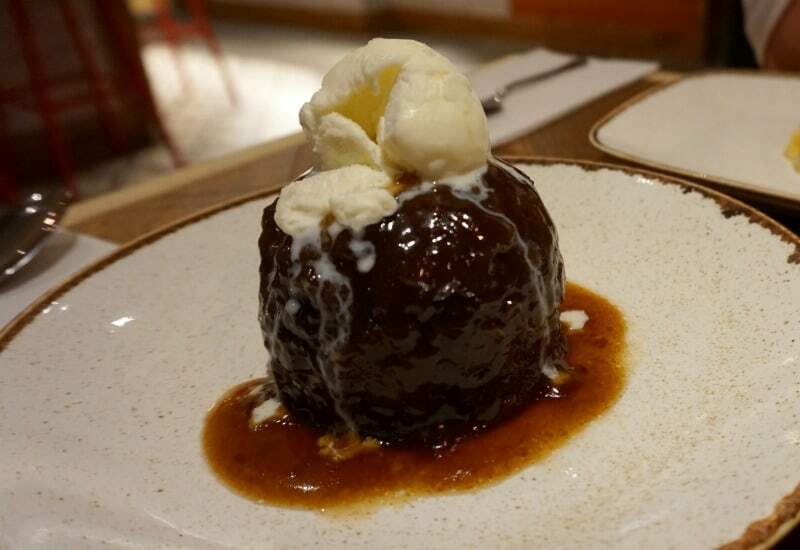 The sticky toffee pudding was everything that it should be with a sweet sauce and moist sponge topped with a creamy delicious ice cream. All the right boxes were ticked for sure. As well as lovely food, we received fantastic service from Amy who looked after us for the entire evening. She checked in to make sure we had enough drinks and gave us helpful advice when we couldn’t decide what to have from the menu. The timing of the food to the table was excellent and every course hit the spot. 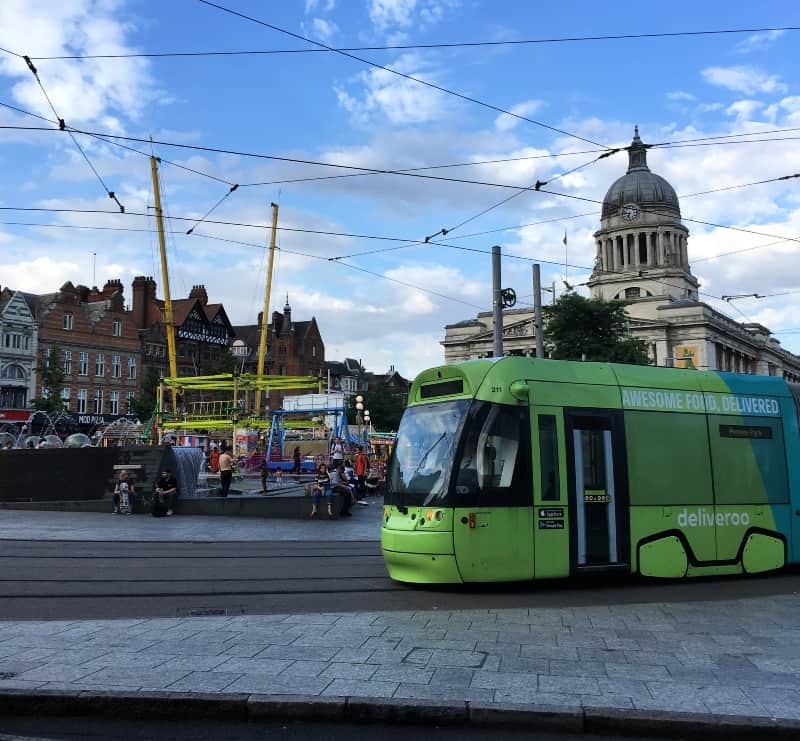 If you are looking for the best restaurants in Nottingham city centre we wouldn’t have any trouble in recommending a visit to Bar + Block for dining out. 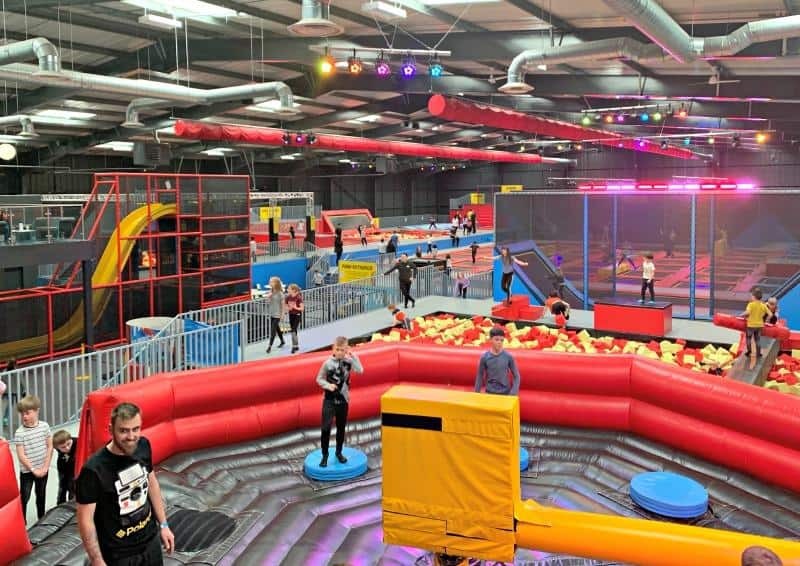 It would suit couples, groups of friends or work events really well and you are in a great location to either continue your evening around the bars in Nottingham or for staying at the Premier Inn on Maid Marion Way. As well as dinner, the restaurant also serves breakfast, brunch and lunch opening from 6.30am til late 7 days per week. If you are not a meat lover, don’t worry as veggies are also catered for and you will also find chicken and fish on the menu too. We were provided with a complimentary meal in exchange for this review but all thoughts and opinions are our own.